Rumen additives used in the beef industry to prevent "off feed" conditions include buffers, neutralising agents, bentonites and rumen modifiers. sodium and potassium carbonate and magnesium oxide. diets, fine chopped and fermented forages are fed in combination with highly fermentable carbohydrates. bentonite and ionophere rumen modifiers (eg., monensin). This article discusses the more common additives used in beef cattle rations and outlines their mode of action in reducing the incidence and severity of acidosis. The most frequent cause of acidosis (and laminitis) occurs with the introduction of diets which are rich in highly fermentable carbohydrates (eg., starch and sugars). The degree of acidosis (acute or subacute) depends on the "metabolic insult" which depends on the level of feeding of highly processed "fast" grains and low levels of "effective" fibre. With a build up of ruminal acids, the activity of fibre digesting bacteria is reduced, limiting roughage intake and digestion. "Acidosis reduces rumen pH and depresses fibre intake"
Roughage intake stimulates chewing and the production of saliva buffers which are necessary to maintain a healthy rumen. "Additives are a poor substitute for quality roughage"
Whilst additives can reduce the incidence and severity of digestive disorders, they are not a substitute for suitable levels of high quality effective fibre (eNDF) and properly balanced rations. Salival buffers contain bicarbonates (sodium and potassium) and have a pH of 8.4 (alkaline). Rumen pH of cattle and pasture based diets range from 6.2–7.0 and saliva buffers play a major role in maintaining an optimal rumen pH (Note – with very succulent feeds (eg., immature ryegrass) rumen pH can be low (due to low fibre intake and high levels of soluble carbohydrates) and the inclusion of grain in the diet can compound digestive upsets. "Rumen acids must be buffered to maintain a healthy rumen"
Adult cattle on high roughage diets can produce up to 150 litres (+/- 30 Ltrs) of saliva per day. The amount of saliva secretion depends on the structure, particle length, quality and the level of roughage intake. At 6.0 rumen pH fibre digestion starts to decline. When rumen pH is 5.8, 40 per cent of the fibre in the diet is digested, at 5.5 pH digestion of fibre is approximately 20 per cent and at less than 5.2 pH there is limited fibre digestion. "Low intakes of low quality fibre reduces the production of salival buffers"
Rapid fermentation of highly fermentable carbohydrates in low fibre diets increase acid production and reduces rumen pH. The reduction in rumen pH further impairs roughage digestion and intake depressing rumination and salivation. Reduced salivation may be compensated by feeding additives (eg., buffers and neutralising agents) to augment the natural buffering ability of the animal. Unaccustomed high levels of grains, particularly highly processed "fast" grains. "Higher intakes of grain lowers rumen pH and reduces fibre digestion"
Rapid fermentation of grain causes the rumen pH to plummet. The reduction in rumen pH impairs the growth of cellulolytic bacteria depressing total dry matter intake of roughages. The depression of fibre digestibility as a result of feeding highly fermentable carbohydrates is most rapid with highly processed fast grains (eg., steam flaking or finely ground corn and particularly overprocessed wheat). beef cattle rations include sodium bicarbonate, magnesium oxide, calcium carbonate, ionophores (eg., monensin) and sodium bentonite. The mode and site of action of commonly used additives are shown in Table 1. Note 3: It is suggested that additives when fed at the correct rate, increase fibre intake and maintain rumen health when stock are introduced to high grain – low fibre diets. Studies suggest that a further mode of action by buffers and neutralising agents also appears to reduce digestive disorders. 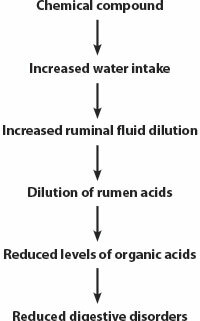 These chemical compounds increase water intake and modify rumen fluid dynamics (Diagram 1). Increased fluid flows also increase the passage of starch from the rumen to the lower intestine. This action increases the importance of compounds that maintain the pH of the intestine (Table 1). True buffers that prevent increased acidity include sodium bicarbonate (Na HCO3) and potassium bicarbonate (KHCO3). considered one of the better buffers. fibre digestion and feed intake in high grain-low roughage diets. Na HCO3 found in saliva. (Note – supplemented Na HCO3 levels are well below the secretion of bicarbonates of cattle on high roughage diets). since heat and humidity suppresses forage intake and therefore chewing activity and the production of saliva is depressed. Limestone (calcium carbonate – Ca CO3) has a limited buffering capacity in the rumen but has been shown to regulate the pH of the intestines, improving starch digestion and faecal pH (Table 1). the rumen and starch digestion in the intestine (Table 1). Na HCO3) i.e., 1:3 ratio in the ration) provides a better prevention to digestive disorders. Magnesium is also an important mineral supplement in high grain diets. Magnesium supplements (30-45gms/adult head/day) are also necessary with lush temperate pastures (eg., ryegrass) to prevent hypomagnesia. Bentonite is a type of clay that has a high water absorption and swelling capacities as well as high cation exchange capacity. Variations occur in both the structure and chemical (calcium or aluminium) composition of bentonites. Sodium bentonite (NaB) has the ability to absorb at least five times its weight of water and swell to 10-15 times its dry matter volume. Calcium bentonite (CaB) does not have the same capacities (water and cation absorption) as NaB and its properties vary considerably depending on its source. It is suggested that incorporating 3-5 per cent bentonite in the ration moderates grain consumption and subsequently the digestive disorders when grain diets are introduced to stock (Table 1). Some of the best feeding results have occurred when NaB (2 per cent) has been used in conjunction with Na HCO3 (2 per cent). Studies have found that a combination of these compounds reduced the incidence and severity of acidosis when cattle were introduced to high gain diets. Calcium, phosphorus and magnesium are absorbed by bentonite. At high levels of bentonite in the ration (4-5 per cent), it is recommended minerals low in grain diets (i.e., sodium, calcium, magnesium) are supplemented. Minerals can be supplied as chemical buffers (eg., Na HCO3) and/or neutralisers (eg., Mg0). Rumen modifiers have played an important role in the beef industry with well recognised benefits in high grain-low roughage diets. Importantly ionophores have been found to reduce the occurrence of acidosis due to increased rumen pH levels. The modes of action include the modification of the total levels of rumen organic acids and improving the digestibility of fibre. For instance, monensin is an ionophore-antibiotic which selectively modifies the rumen microflora and improves the efficiency of digestion. Monensin acts by inhibiting the growth of lactic acid forming bacteria (S bovis and lacto bacillus) reducing lactic acid and total organic acid levels. Table 2 provides guidelines on the levels of additives used in high grain-low fibre diets. (a) Excess levels of buffers (i.e., >3 per cent) can reduce the palatability of the ration and reduce feed intake. (c) Excess calcium can upset the Ca:P ratio and limit phosphorus availability particularly in low phosphorus diets. (d) Excess potassium can accentuate the incidence of hypomagnesia with stock grazing lush temperate pastures. (e) Excess sodium bicarbonate (>4 per cent) can cause alkalosis and reduced feed intake. (f) Excess bentonite (>5 per cent) can reduce the availability of key minerals. (g) Excess Mg0 can cause severe scouring. "Most things are good in moderation"
The most common reason for including additives to the diet are to compensate reduced saliva production when stock are fed inadequate amounts of fibre in high grain diets. Additives have the potential to prevent excess acid production as a result of feeding highly fermentable non structural carbohydrates (i.e., starches and sugars) that reduce rumen pH and fibre digestion. A combination of certain compounds are better at preventing "off feed" situations. Incorrect levels of additives can aggravate mineral balances and deficiencies (eg., excess calcium and magnesium). With high levels of additives, reduced palatability can cause feed rejections. The acceptance of buffers can be improved by gradually increasing the level of compound in ration over 14-21 days. The best time to incorporate additives is when feeding the introductory grain starter ration. Used correctly, buffers and neutralisers can be important mineral supplements in high grain diets. Best results require that additives are fed at the correct levels and properly mixed into the ration. Combinations of buffers (eg., 2 per cent NaB, 1.5 per cent Na HC03 and 0.5 per cent Mg0) can reduce the intake of any one compound and improve the efficacy of the additive. Additives are most effective during the introduction phase of high grain diets or when there are changes to the composition of the ration. It is essential that ionophore antibiotics are presented at least 2 days before there is a carbohydrate challenge. The ability of bentonite to absorb minerals makes it necessary to supplement minerals that are low in high grain diets (eg., Ca and Mg). The combination of additives can prevent mineral imbalances (eg., an additive comprising of 30 per cent Na B, 25 per cent Na HC03, 25 per cent Ca C03 and 20 per cent Mg0 – totalling 5 per cent of the ration). Whilst additives have a useful role in certain feed situations, it is emphasised that they are simply ration formulating tools and do not replace the need for efficient feed management and safe feeding systems. "Additives are not a substitute for good quality roughage, proper ration formulation and good feed management".